As the days pass and we edge closer to Samsung’s launch of its next Galaxy S flagship smartphone, the Samsung Galaxy S7, leaks and rumors of the device don’t seem to have any intention of stopping. We’ve had detailed exposures of specifications, features and more if you’ve been following us regularly, which give us quite a fair idea of what to expect on the smartphone. Samsung also recently unveiled its latest Exynos 8890 processor that will be powering the Galaxy S7, alongside Qualcomm’s Snapdragon 820 and today some benchmarks have surfaced that claim some truly amazing performance from the chipset. When it comes to mobile processors, Samsung’s managed to establish itself as a performance powerhouse, particularly over the course of this year. The Korean manufacturer’s Exynos 7420 is undoubtedly one of the top performing, if not the top performing chipsets available in the market, and by the looks of things, the Exynos 8890 is more then ready to follow in its predecessor’s footsteps. 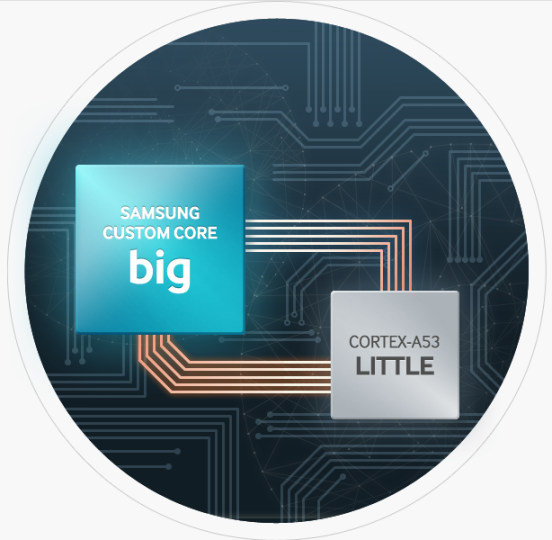 With the Exynos 8890, Samsung takes a partially new approach with its silicon, as the processor comes equipped with custom Mongoose M1 cores, in addition to four of ARM’s Cortex A53 offerings. The performance of these cores should be interesting, as it is the first time the Korean manufacturer has taken such a step. the 8890 also comes with a more compact design, owing to the processor’s modem being integrated directly into it, which allows for greater space saving and performance efficiency. The benchmark scores do lend credibility to Samsung’s claims of superior performance on the latest Exynos, if they’re correct. 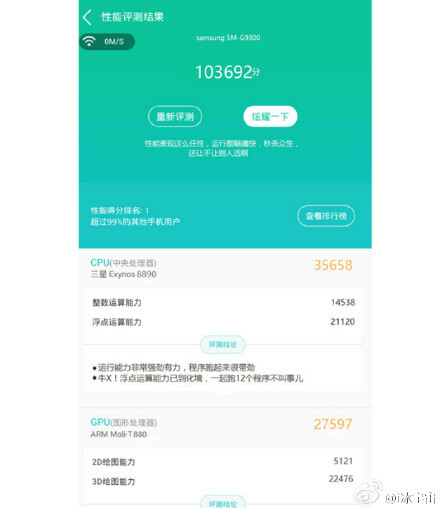 Originating out of China, the scores show the Exynos 8890 running on a Samsung smartphone (which we’re assuming is the Galaxy S7) achieve a score of 103692, that should be an eye popper for many. When this score is compared to other processors, Samsung’s latest processor leads the pack by miles indeed. But given the nature of leaks and rumors these days, we’d be hesitant to take anything for granted until we’ve had a chance to run the Exynos 8890 by ourselves. Similar scores in the past have confirmed the chipset’s lead over its competition, including the Snapdragon 820 and Apple’s A9, so Samsung seems to be heading quite strongly towards the Galaxy S7 launch indeed. Thoughts? Let us know what you think in the comments section below and stay tuned for the latest.